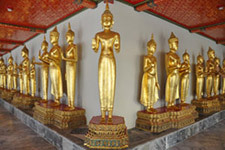 Bangkok is the usual gateway for most travellers, and you should plan on three or five days in the capital. This should allow sufficient time for seeing the major sights such as the Grand Palace and Temple of the Emerald Buddha, Wat Arun, Wat Pho and Vimanmek Mansion. Perhaps also a trip along the Chao Phraya River or a shopping jaunt to Chatuchak Weekend Market. so take an out-of-town excursion (Ayutthaya or Kanchanaburi are top choices). Check out some of the suggestions listed under our Sightseeing section. If a beach vacation is your priority, Bangkok could be followed by a week at Phuket, Phi Phi, or Samui Island, which offer the most exotic settings. Should your time be limited, the resorts of Pattaya, Rayong, Cha-am and Hua Hin are closer to the capital. Thailand further provides excellent facilities for sporting vacations - golf, scuba diving, yachting, and mountain biking. A two-week stay gives time for general sightseeing and special interest activities.